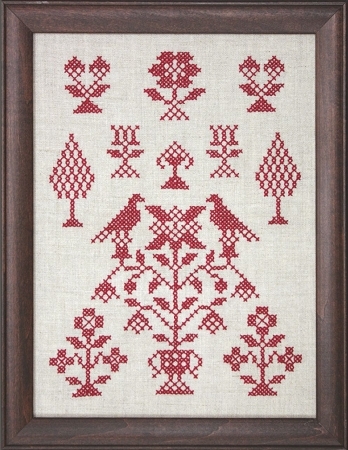 Antique Red Designs is a cross stitch design printed on natural European linen.This stamped sampler 9 x12 is a larger cross stitch appearing in our Beginner series and one that can please anybody that likes red and Early American Folk designs. These types of motifs are found in most kinds of samplers and are an expression of that era.Good practice for a young girl or anyone wanting to sew a sampler.It would look lovely hanging on a wall. I love this sampler. I am very new to cross stitch, and prefer a stamped piece. The stamping is clear, and large enough for a beginner, still resulting in a beautiful design, and introducing me to a quality piece of linen, as opposed to the Aida that is so often used. I keep Country Stitching on my favorites and have recommended the site to others that cross stitch. I will be purchasing more designs in the future.